6-in-1 Golf Swing Training Aid. Straight ARM and WRIST = Straight Shots. Learn a Straight Arm Swing by wearing it while you play 18 holes. Or practice with it to learn 5 more swing fixes. A Brain Trainer Guaranteed to Lower Your Score. CALL 905-464-8718 for more info. If the following info does not answer your question, call 905-464-8718 or send us an email with your phone number to: sales@golfstr.com. One Size Fits All: Fits around the circumference of your 5 inch to 14 inch Left or Right forearm or wrist. It can be used on your bare arm or over a shirt or sweater. You can PURCHASE GOLFSTR+ on this website, at golf stores throughout the world or call 905-464-8718 if you need assistance making your purchase. PERFECT MY GOLF (www.perfectmygolf.co.uk) in UK. PayPal SECURITY: On this website we have setup PayPal to manage the security for all purchases. PayPal not only allows you to pay using a PayPal account but also allows you to make your purchase with Visa, MasterCard, American Express, Discovery Card or a DEBIT CARD . In all cases your payment is managed by PayPal (for extreme SSL security). Innovation Unlimited Inc. never sees a credit card or PayPal account number. 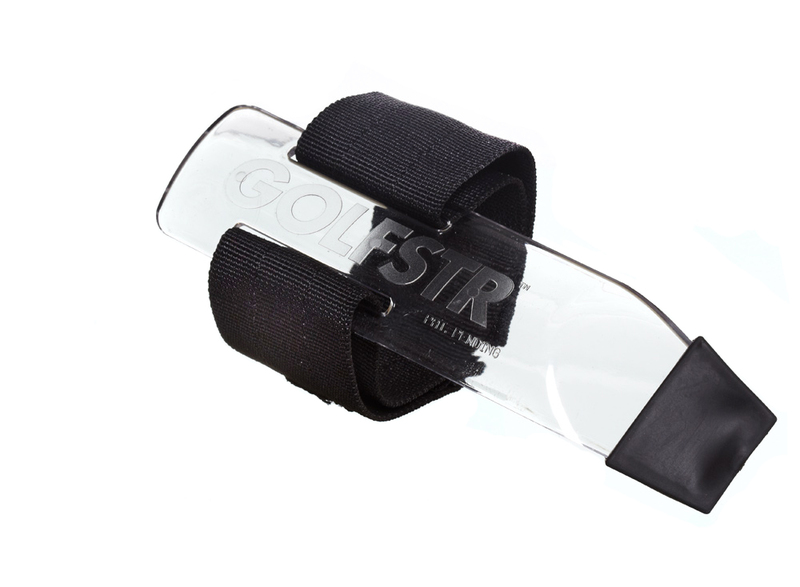 GOLFSTR+ is available in limited Golf Retail locations and through this website for $29.99. For Shipments outside of North America a Shipping and Handling fee is automatically added: $10 for the first unit and $3 for each additional unit. Taxes are only applicable on Canadian purchases. Duty is typically waived on orders under $70. Mail Order: You also have the option to mail your order and pay by check or Money Order in the amount of $29.99. The Contact Page lists all of our contact information (Innovation Unlimited Inc., 65 Kaitting Trail, Oakville, Ontario L6M 0T6 Canada). All orders are processed for shipment within 2 days. Delivery can take an additional 7 days. International Destinations: We ship to any location in the world. Recent customers in Spain, Philippines, Indonesia, England, Scotland, Malaysia, Germany, Singapore, Tasmania, South Africa, Australia, France, Turkey, New Zealand, Netherlands, Switzerland, Sweden, Mexico and Ireland are pleased with their orders. All international orders have arrived within 4 weeks (or as early as 11 days in Switzerland). Unfortunately we have had reports of deliveries in Perth Australia in 6 weeks. We have no control over delays for International deliveries. Large – Fits 5 -14 inch forearm or wrist, Small – Fits 5-10 inch forearm or wrist.